Season the steaks with olive oil, salt and pepper and arrange on a baking sheet. Broil steaks according to package directions. Mix the pesto and butter together in a small bowl and set aside. Boil the pasta, drain and toss with 6 tablespoons pesto butter. During the last 5 minutes of broiling, add the tomatoes to the baking sheet. 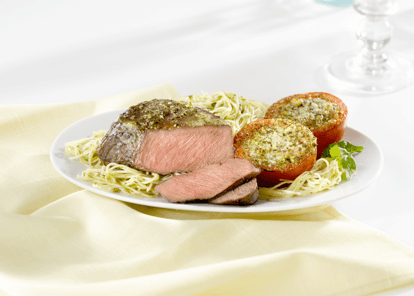 Broil for 3-4 minutes, and then top the steaks with a dollop of pesto butter and brush the tomatoes with it also. Broil 1 minute more and serve with the pasta. Sprinkle Parmesan cheese over the pasta and tomatoes before serving.